“People often ask me why I keep running to the hospital and back with Bittu, despite the fact that he is not my biological child. But I tell them that he calls me ‘ma’ and I will do anything to keep my son alive. I have still not yet come to terms with the fact that he is fighting something as deadly as a brain tumor. I will do anything to save him but I just don't have the money for it ,” Putul, Bittu’s aunt. 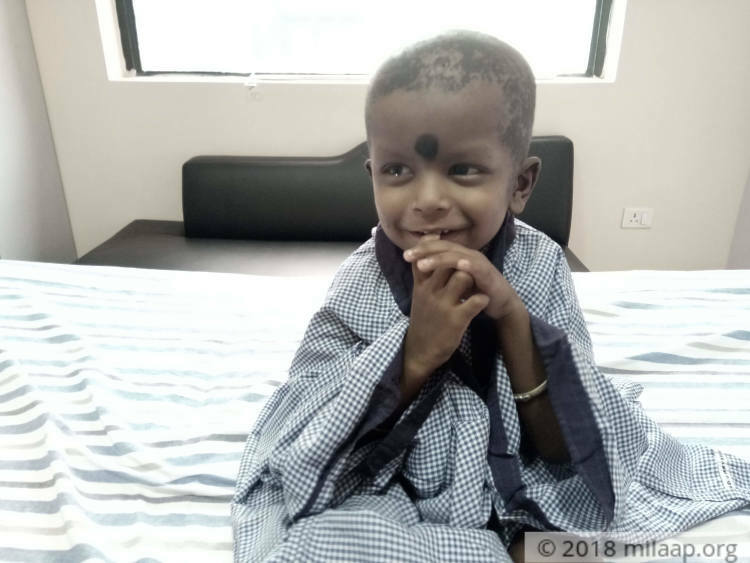 3-year-old Bittu has been very fortunate to have 2 mothers and 2 fathers - the biological ones and the ones he regards as his parents - his uncle, and aunt. Nobody in the entire family thought the little boy they loved so dearly would fall prey to such a deadly disease. “Almost 4 months ago, suddenly Bittu complained of a severe headache and had difficulty in walking. What scared us the most was that he was gradually getting squint eyes too. He was unable to walk straight and was constantly falling down. I knew something was severely wrong with him and we needed to get it corrected,” Putul. While the local doctors couldn't figure what was wrong with Bittu, the mothers were adamant to get his MRI done. Their fears came true when they discovered that the little boy had brain tumor. His ‘fathers’ who worked in Rajasthan as silver craftsmen, had to return back home to Hooghly, West Bengal immediately. “Bittu has never called me ‘ma’, but that doesn’t mean he isn’t my son. I am happy to see him with his uncle and aunt because that is what keeps him happy. I was dumbfounded when I got to know my little baby is fighting Ewing's sarcoma, which is a rare and deadly form of a cancerous tumor that grew in his brain. What was worst is that if we couldn’t get his surgery done in next 3 days, he would die,” Sunita, Bittu’s mother. Bittu was taken to Bangalore immediately. After much struggle, they finally managed to get the tumor out of his body. 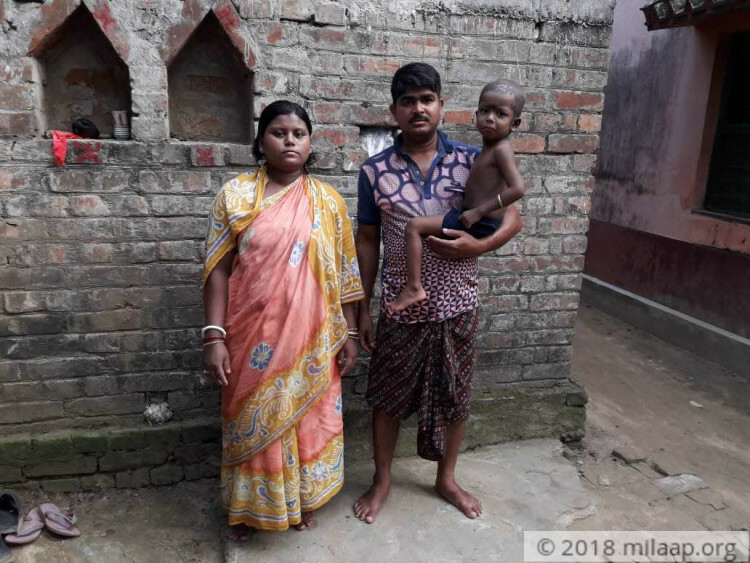 While both Putul and Sunita thought they had successfully managed to get their child back to life, his sufferings didn’t end. The little boy needs chemotherapy to be out of danger now. 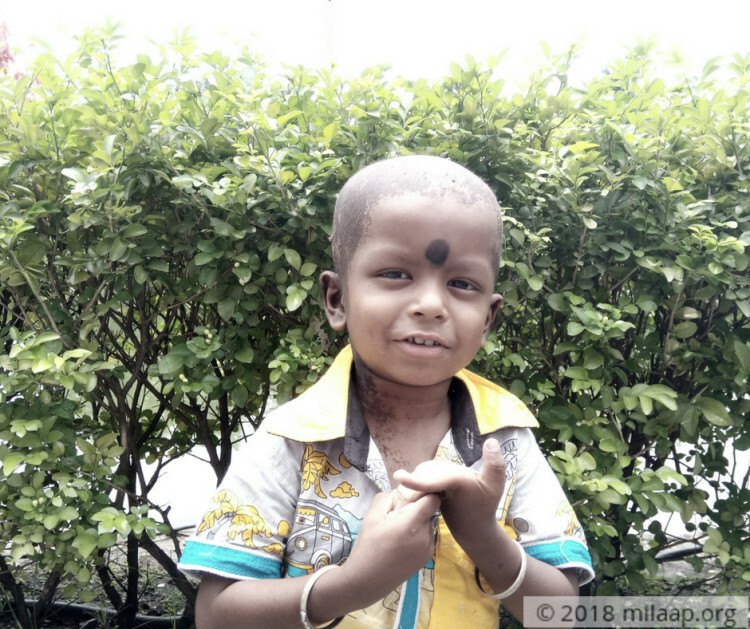 “When Kamal and I took Bittu for his surgery, we only had the hope that somehow we could manage to pay for his treatment. Kamal had to work in some restaurants so that we could get money. Sunita and Biswarup (Bittu’s parents) were back at home begging and borrowing from every villager and relatives. While Kamal and Biswarup were in Rajasthan they could somehow manage to earn Rs 3000 per month. With whatever they could send us, we somehow managed the household,” Putul. Bittu’s treatment so far has cost the family a whopping Rs 6 lakhs. By doing odd jobs, Kamal and Biswarup earn Rs 174 a day. They get paid once in 2 months. The family has been forced to sell off the lands they had. 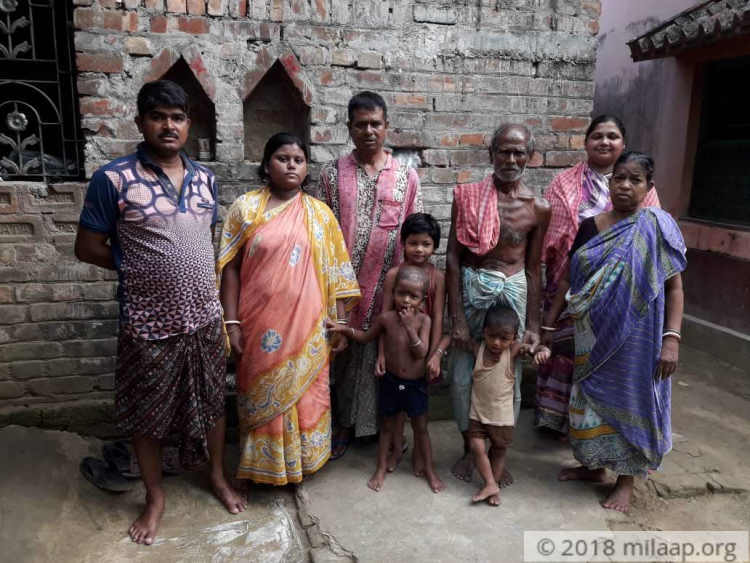 They have been living in debt since Bittu fell sick. The family is desperate to free him from all his pains. But they can’t even afford two square meals a day, let alone the cost of chemotherapy. Although Bittu has been blessed with two sets of parents, his fate has been too harsh on him. His family has not just exhausted everything but are oThn the verge of coming on the streets, but for them, nothing is more important than keeping Bittu alive. 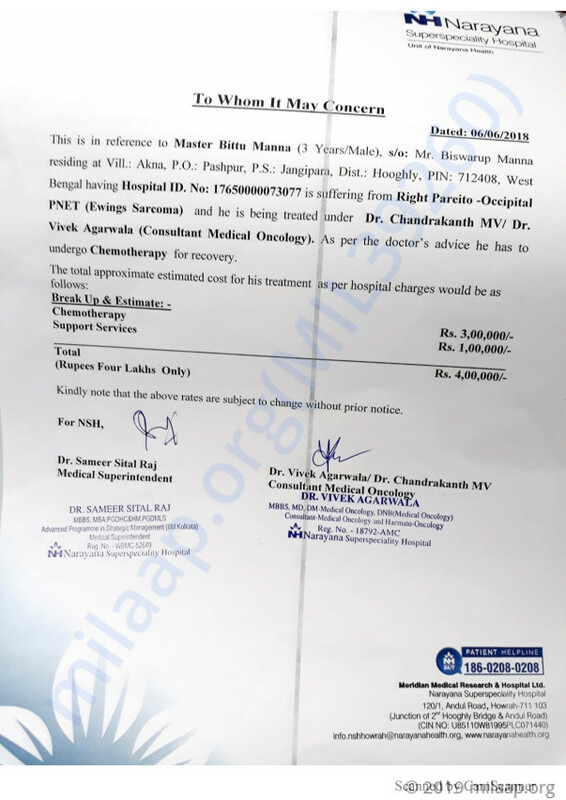 The cost required for his chemotherapy is Rs 4 lakhs and the family has nothing left to save him. Thank you so much for the love and support you have shown towards Bittu. Currently, he is at home and doing fine. He is undergoing chemotherapy as prescribed by the doctors. So far, there are no major side effects and he is responding well. The family requires urgent funds so that the treatment is not hindered. Please share this campaign as much as possible to support them. Please apply to Prime minister national relief fund through your MP & you can get upto Rs. 3 Laksh for treatment.